Here’s a little gizmo that might help reduce the liberal layer of Post-it notes – most of them outdated -- feathering the fridge. The Play is simply a video memo pad that records and holds up to three minutes of messages for playback on its 2.4” LCD screen. The device is magnetized and attaches to any metallic surface, and comes with magnetic wall-tape so you can mount on other surfaces, too. There’s also a carry strap so you can hang it on, say, the key hook by the door. 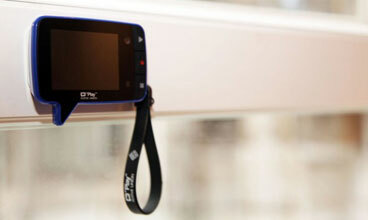 Taking cues from Flip video camera’s super simple design, the Play’s three button operation makes it easy for just about anyone to leave reminders, love notes, bye-byes, jokes-of-the-day, songs, etc., etc. All messages feature a time and date stamp, too. It’s this combination of utility and fun that make Play so appealing. It runs on 3 AAA batteries and comes in green, blue, red, pink, white, purple and black. Price: $59.99 at NativeUnion.com.